CARLSBAD, CA (CelebrityAccess MediaWire) — A blast from the past will ring out at the 2013 NAMM Show as manufacturers responding to consumer demand introduce new products with a vintage look and sound. Retailers, having heard the growing demand for vintage-inspired musical instruments and equipment will be looking for new products that meet the demand of customers clamoring for unique pieces. 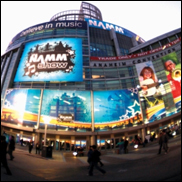 The NAMM Show returns to Anaheim, CA from January 24-27, 2013. "Over the last few years, gear that looks, feels and sounds vintage has taken off," said George Coutretsis , GM of Chicago Music Exchange. "The trend in indie-rock is toward using vintage gear, which is building demand in a younger adult audience for these pieces. We're looking for products at the NAMM Show that make the player feel unique and inspire them to start bands, make music and play more." "The major brands and as well as our smaller, boutique craftsmen are boosting this trend with some truly unique instruments, many of which will be unveiled or highlighted at this year's NAMM Show," said Joe Lamond , president and CEO of NAMM. "Artists around the globe are constantly looking for music and sound products that help them express their creativity and NAMM members will continue to look forward as well as to legacy designs to serve them." Nostalgia for what Neil Young called the "old, folky days" seems to be the inspiration for the retro collections soon to be offered by Bedell Guitars. Designed after the guitars of the early '60s, the Coffeehouse series and the 1964 series feature all solid woods, dovetail neck-joints, classic comfortable neck profiles and other details designed to recall the look and sounds of acoustic guitars produced 50 years ago. The company plans to unveil the series at the NAMM Show 2013. "The music industry is naturally vintage minded. We value things with a history," said Ryan Bouslaugh of Bedell's artist relations department. "A 2012 Toyota Camry drives just great, but really, everyone wants that classic '57 Chevy." Some of these new additions will be seen for the first time at NAMM 2013. Fender Guitars, the roots of which reach back to the very era many are resurrecting, plans to debut guitar and bass additions to its already-popular Pawnshop series. Also at the show, the Excelsior, Fender's distinctive tube-combo amplifier will be re-issued in a limited edition. Gibson honors one of the godfathers of guitar with its collection of tribute Les Paul guitars, made in the style of the '50s, '60s, '70s and beyond. The series, which is dubbed "The Year of Les Paul " collection, will be introduced at NAMM Show 2013. C.F. Martin & Co.'s four-piece Retro Series that debuted at NAMM in Nashville will be featured prominently by the brand at the show. The Retro Series is based on C.F. Martin & Co.'s guitars from the 1930s and '40s, melding traditional models with state-of-the-art technology.